Apart from a home security system, what else can homeowners do to prevent break-ins? Although alarm systems can notify you that a burglar is entering your home, it won’t always deter or prevent burglars or break-ins. Unlike tinted security window film, alarm systems won’t prevent anyone from peeping inside your home, nor will it prevent the window from being smashed. Window tint serves as a theft preventative measure as potential thieves are not able to see through the tinted windows of your car, home or office. At Doctor Window Tint, we believe ‘prevention is better than cure,’ and there are multiple ways that window film can help to provide security and protection to your home, vehicle and family. Both our High Performance and Economy Line is perfect for consumers who want to prevent onlookers from peering inside. If you can remove the incentive for a smash and grab, you can help remove the risk. Burglars like to peep inside homes and vehicles to see what they can take – if they see something nice, chances are that will motivate them to pick your home over a home where they cannot see inside. Having window tint limits visibility to the outsider, and works by installing a thin, tinted laminate film onto the exterior or interior the window. Window film comes in a range of different tints, all of which allow for enough light for you to see through while preventing people from seeing valuables left inside your vehicle. Nothing to see? Nothing to steal! 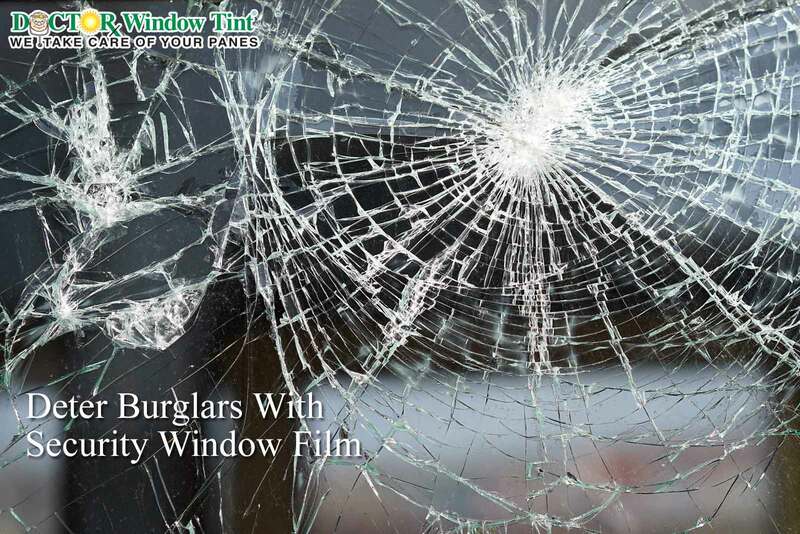 The great benefit with Security Window Film is that it makes your windows shatterproof which prevents harm caused by broken glass shards. Our security window film works by holding all the pieces together, using an elastic-like film that can withstand more pressure. What’s more, your vehicle’s upholstery and home contents will be protected, saving money spent on damage repair. Smart Window Film is one of our latest technological innovations, giving you the benefit of tinted windows instantaneously with the switch of a button. By using your smart phone, you can turn a window from clear to opaque in seconds. This provides the security benefit of privacy when you need it. This is also great for business who need boardrooms or other private meeting spaces, as it can transform a space from visible to private in a matter of seconds. Decorative window film (or specialty film) can be a stylish way to limit visibility in your home or office. While it still allows for light to pass through, frosted glass makes the glass opaque, so that people cannot see through the glass. This is suited to bathroom windows, shower doors, sliding glass doors and office windows. Most decorative window films come in a variety of patterns, textures and styles, meaning that your home or office is protected – while looking good too! You won’t have to compromise your view or comfort with Doctor Window Tint’s security window film – Contact us today to set up a free consultation and allow us to explain the benefits of our window tinting lines!